More than just a macro lens, the AF-S Micro NIKKOR 60mm f/2.8G ED can achieve great results with nearly any subject. 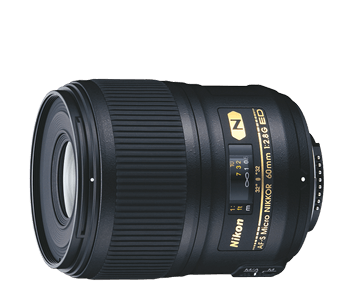 From breath taking close-ups with gorgeous background blur at its wider aperture settings, to detailed portraits and more, this versatile lens combines legendary NIKKOR optics and advanced Nikon lens technology for spectacular overall performance and superior image quality. Photograph beautiful close-up and macro images up to life-size (1:1 reproduction ratio). Crisp sharpness and subtle details are made even more obvious by the dramatic background blur. The renowned micro NIKKOR optics deliver the best possible image quality, ensuring that even the finest details are captured. Bring new levels of detail to a wide variety of subjects, including portraits. With its broad focusing range and fast f/2.8 maximum aperture, the AF-S Micro NIKKOR 60mm f/2.8G ED is capable of more than just macro shots. The Silent Wave Motor (SWM), an exclusive Nikon technology, enables incredibly smooth, silent and accurate autofocusing with seamless manual focus override for increased versatility when adjustments are required.